If there is doubt of fraud and theft regarding the funds or some confidential information then, we can provide the suitable information regarding the person involved in financial fraud and theft. We are offering Misuse Of Confidential Information investigation service to our clients in Pune. 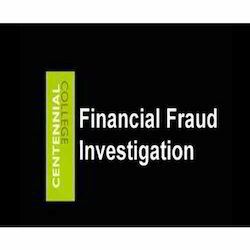 If there is doubt of fraud and theft regarding the funds or some confidential information then, we can provide the suitable information regarding the person involved in financial fraud and theft. We help companies find ways to manage risk, investigate alleged misconduct, and measure the financial implications of disputes. With experience across multiple industries, BRV has the global reach that today's companies need. - We investigate into corporate scams and help in getting hold of the culprits. - We collect the necessary evidences which may be used in case of any lawsuit. - We also investigate into the matter of financial instrument i.e., Cheques, Drafts, Bills etc. Currently it has become quite easy to get access to bank loans or credits or open accounts. This leads to many such incidents where people fake their documents in order to secure a loan or open an account. This is fraud and the Mumbai detectives help in uncovering such issues effectively. Combating Organized Financial Crimes and Money Laundering.